Build in a glass without ice and serve. Note: this is a room temperature cocktail. After the M. and St. L., I was in the mood for another drink, so I began perusing Frank Meier's 1934 The Artistry Of Mixing Drinks. There, I was tempted by a room temperature drink -- a Rum Scaffa which was different than Scott Holliday's Rum Scaffa, Deep Ellum's Franklin Mortgage Co., or my Madame Mustache that I served at the Blue Room. Instead, Meier's Scaffas are equal parts spirit and Benedictine with a dash of Angostura Bitters. 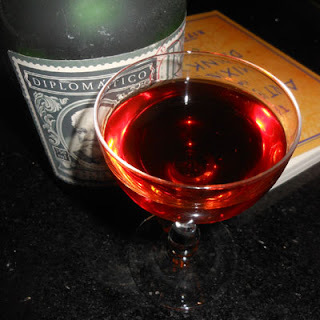 For a rum, I wanted a rich, aged one and opted for Diplomatico. The caramel notes of the aged rum contributed greatly to both the Scaffa's aroma and the flavors in the sip. Next, on the swallow, the rum's grassiness meshed with the Benedictine and Angostura's herbalness, and the finish highlighted the liqueur's minty notes.